My final finish of 2014! I bought the fabrics: 7 light fat quarters (black on white), 12 dark fat quarters (reds), accent and binding fabric (black on black), border (white on black) and backing... eight and a half years ago during the 2006 Shop Hop by The Bay. I had no idea what I was making, but loved the mystery of it. 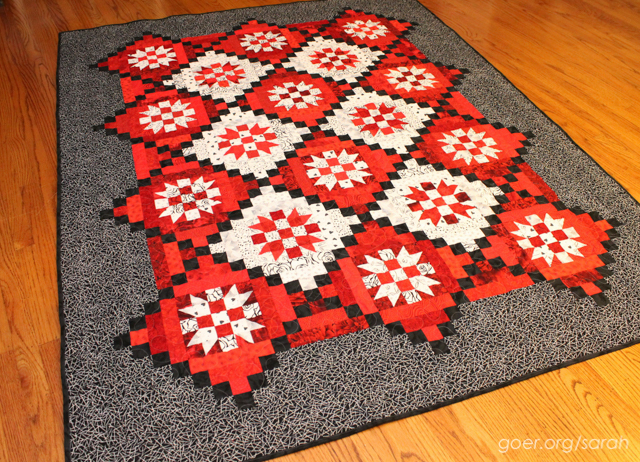 (I had pieced the mystery quilt from the shop hop two years before using bright, bold colors and I'd loved watching the design emerge.) I started it immediately, but back then I wasn't sewing very regularly. I worked on and off over the years and this year I finally tried to really focus on finishing since I was able to carve out regular sewing time. There have been so many progress posts about my mystery quilt over the last year. 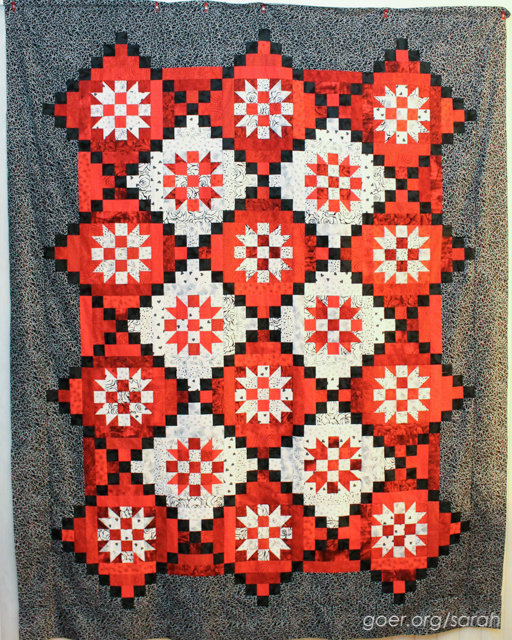 It's so great to finally have a 100% finished quilt to show you. I've come a long way in my skills since starting this. I think this is one of the frustrations of working on a really old WIP. My piecing has improved (yay for a nearly perfect 1/4" seam allowance), I can free motion quilt now, and my understanding of value has improved, to name a few. I've also started using Aurifil thread to piece and quilt and I press my seams open. I quilted in Aurifil 50wt grey #2605 I like to match my top and bobbin thread and decided anything more bold would fight with the fun backing fabric and I wanted it to just blend. It finished at 65" by 83". I'm really looking forward to wrapping this up and giving it to my dear friend. Also linking up to Finish Along 2014 Wrap Up Party. Here's my full list of (mostly still incomplete) Q4 goals. Posted in Quilting. 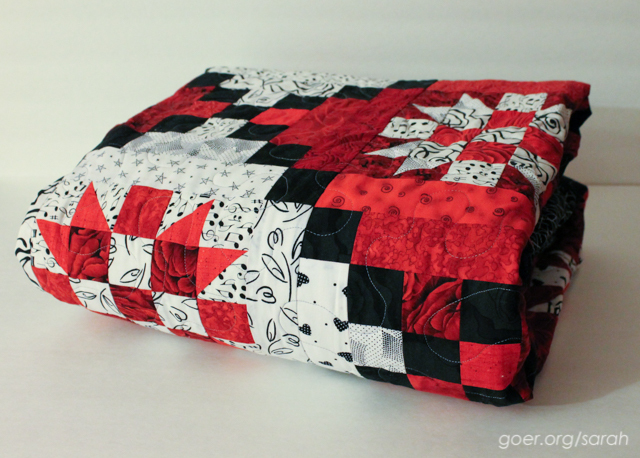 Tags: ALYoF, black, finished quilt, mystery quilt, red, twin quilt, white on December 31, 2014 by sarah. 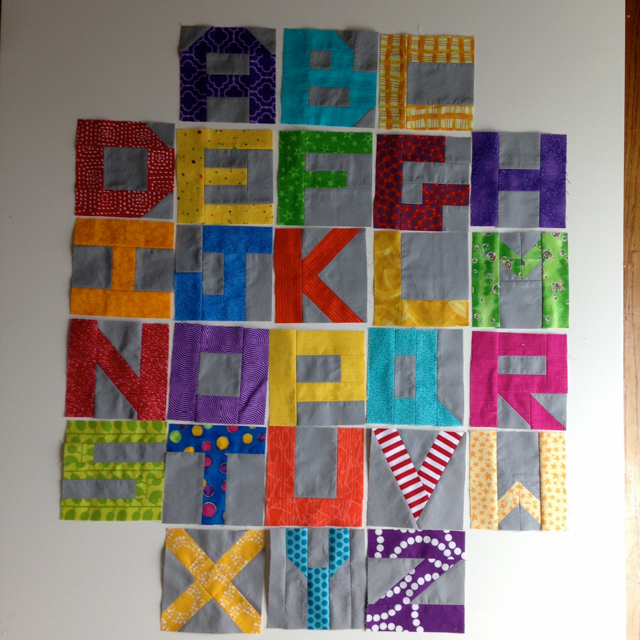 I finished piecing all my letters for my two little letters quilts. I need to cut about a million (okay 84) 1.5" corner squares for the sashing. Then I'll be able to get these all pieced together. Here are my December do. Good Stitches blocks for the Promise Circle. These scrappy domino blocks went together very quickly. I was even able to raid my 2 1/2" strip scrap pile for some of the pieces. They are on their way to Diana in New York. I'm looking forward to seeing the finished quilt. My mother-in-law does embroidery and a while back I noticed that she was keeping her supplies in a plastic shopping bag. 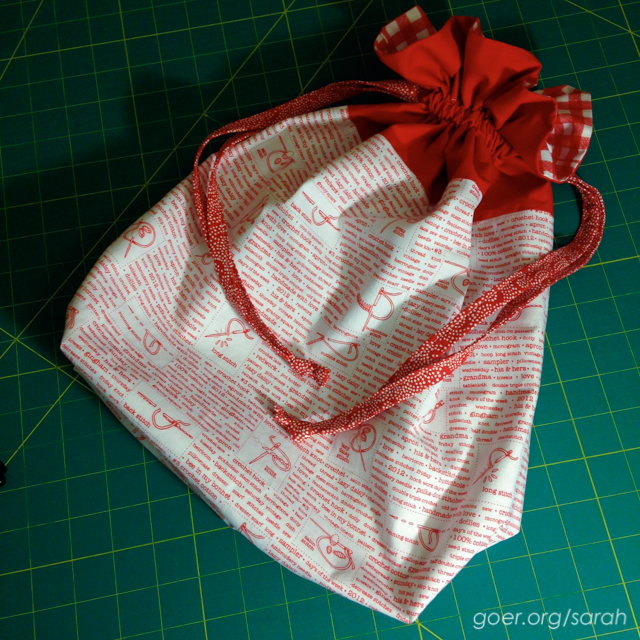 Then I saw this adorable fabric and I decided that she needed a large lined drawstring bag for her project and supplies. This one is the Artist Bag size of Jeni Baker's Lined Drawstring Bag. I started making progress on my Disney Mini Quilt. I won't be able to show too many progress pictures, because I think it would give it away to the recipient, but I'm very excited about my plan and hope she'll love it! I made 10 dozen holiday cookies... 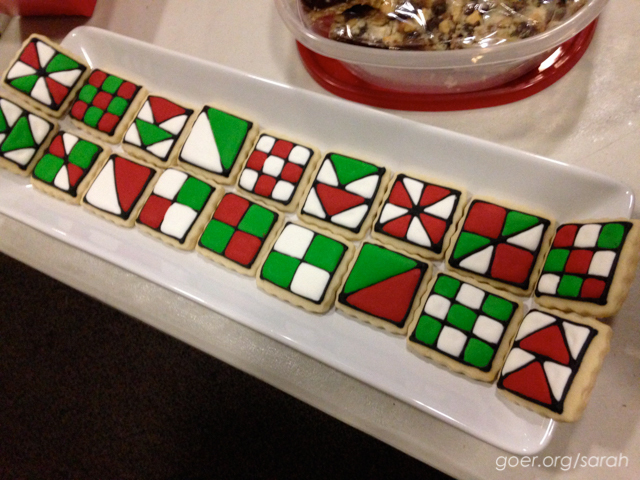 Here are the quilt block cookies I brought to my guild's holiday party and a selection of the 7 dozen that I brought to the annual cookie party that I attend. I guess I've been busy. 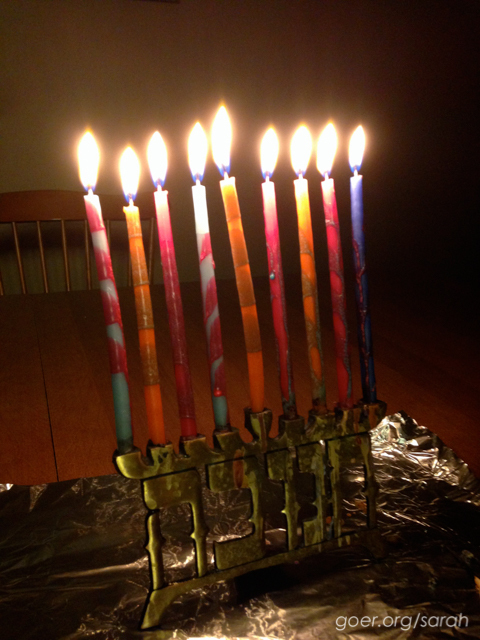 We also celebrated Hanukkah and Christmas with family. I hope the holiday season was enjoyable for you and your family. 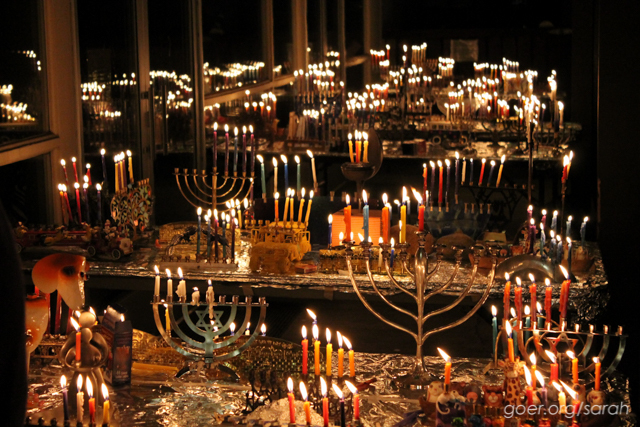 Hanukkah celebration with our congregation (4th night). 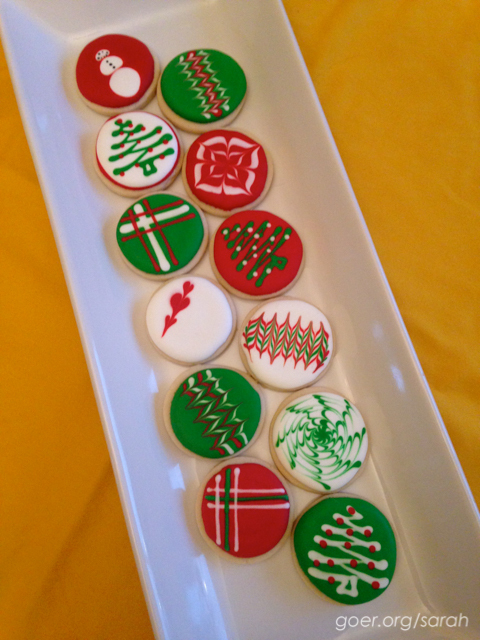 Posted in Cookie Decorating, Quilting, Sewing on December 30, 2014 by sarah. Welcome to those of you who are here to share a finish with TGIFF or to check out what everyone else has been up to. I'm really excited to be hosting Thank Goodness It's Finished Friday! I've been trying to finish up some older projects and stash bust some of my older fabrics... many from when I started quilting in 2002. I recently decided to put together this baby quilt. The feature fabric was leftover from a pillow case that I made for my nephew a few years ago. I decided that the cars would make a cute baby quilt and pulled two fat quarters from my stash to go with it. I did a little measuring of my leftover car fabric and found that I could get twelve 5.5-inch squares out of it (leaving very little waste). 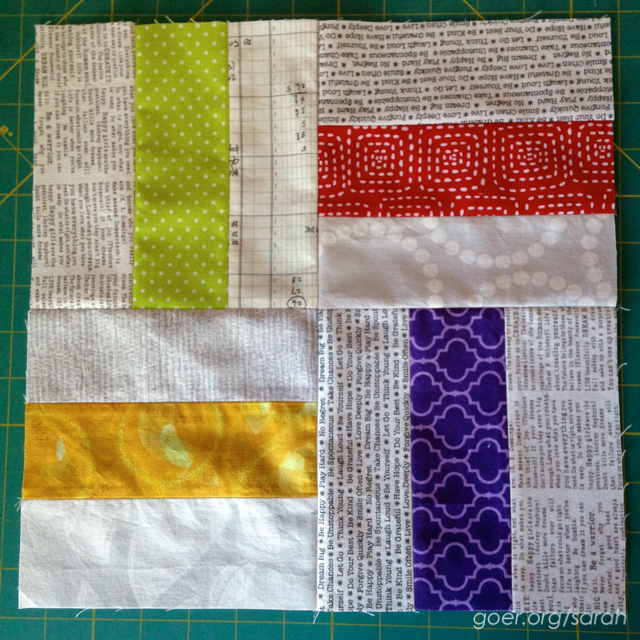 I decided I'd make 4-patch blocks with my red and yellow fabrics. For those I cut 3" strips of each fat quarter and strip-pieced them. Now, I didn't like my options for border fabric from my stash, so I picked up the lovely green dots at PIQF. I used a striped fabric from my stash for the backing and binding. 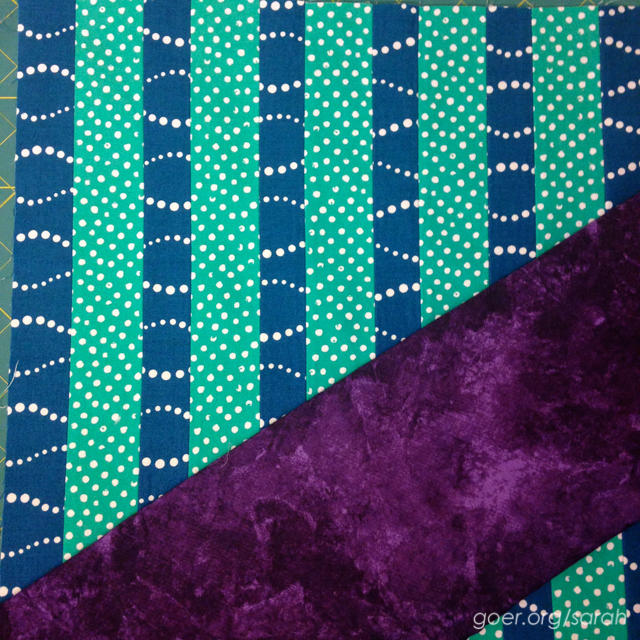 I love the effect of the striped fabric used as bias binding with the diagonal strips. The whole project went together very quickly. This could be done with any size block. Start by determining an optimal size block for your feature fabric. This might be determined by how much fabric you have, what size your pieces are, or the scale of the print. Then to determine the dimensions of your small squares just divide by two, then add 0.25 inch. For example if you had 4-inch squares that you wanted to use for the feature fabric,dividing 4 by two equals 2 inches, then adding 0.25 is 2.25, so the small squares should be 2.25 inches. You could strip piece by cutting 2.25-inch strips, then crosscut into 2.25-inch wide pieces. 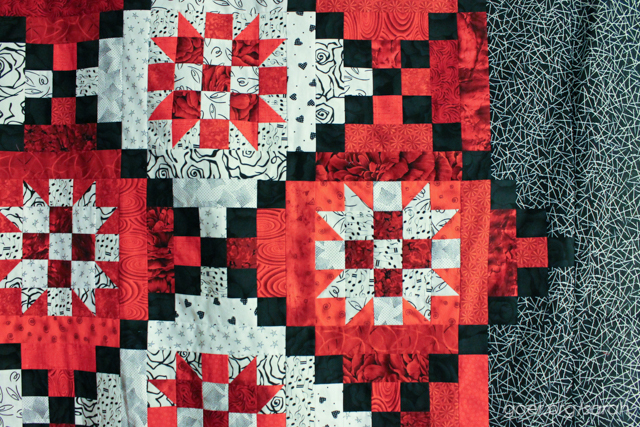 Once you've pieced your 1-patch and 4-patch blocks together, you can add one or more borders to reach your desired quilt size. 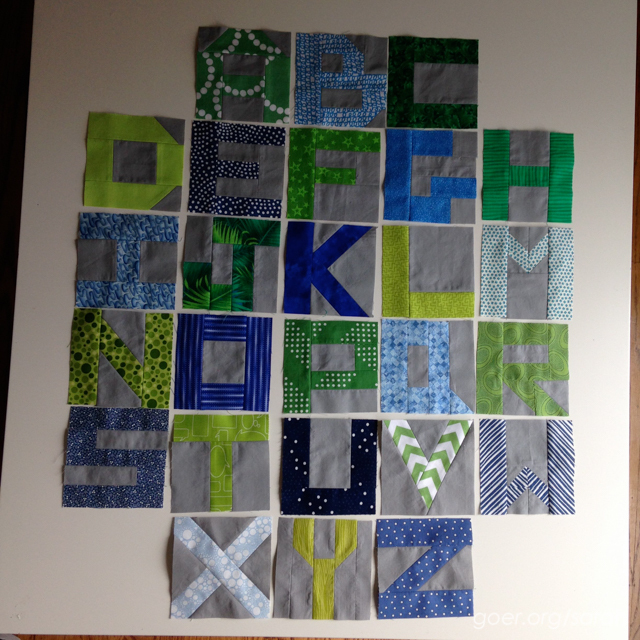 I've linked up to Cynthia's first Oh Scrap! linkup at Quilting is More Fun than Housework... And linking up to Finish Along 2014 Wrap Up Party. Here's my full list of Q4 goals. Posted in Quilting. 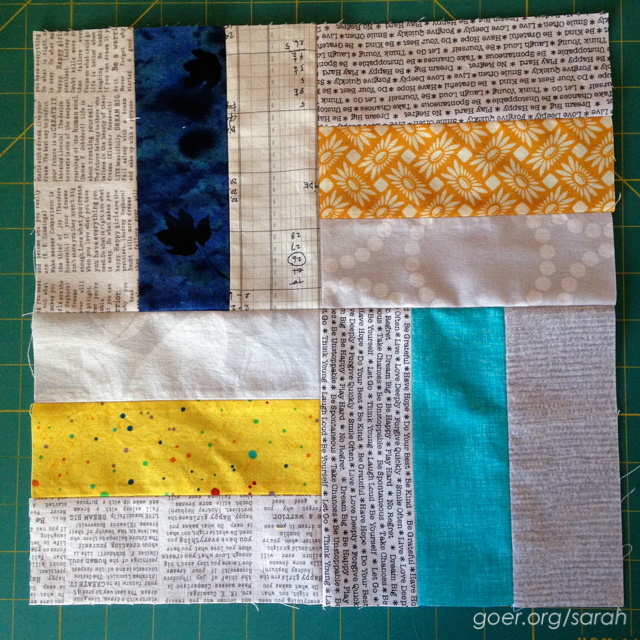 Tags: baby quilt, finished quilt, TGIFF on December 18, 2014 by sarah.